Where education fits each student. Actively involving your child in the learning process. We celebrate the fact that God created all children with curiosity, wonder and the desire to learn. We believe that children come to school with a vast array of previous experiences and knowledge. With the appropriate guidance and direction from their teacher, they can apply what they know to different situations and conditions, making discoveries and connections that make learning meaningful. Students collaborate with peers to create projects and presentations. They observe, research, question, and interpret information. Evergreen encourages students to develop a questioning attitude about the world around them. Active involvement increases the motivation to learn. Students learn through exploration and critical thinking. They understand more fully the process of gaining knowledge. This is a valuable awareness that will serve them well throughout their entire lives. Each student learns and develops at his or her own individual rate. Children learn best when they can learn at their own speed. Education experts tell us that age is a poor predictor of a child’s developmental stage. Some students are already reading at age 4 or 5 while others take much longer to distinguish letters and words. Yet those same “slow readers” may be able to master mathematical equations much quicker than their peers. Multi-age classrooms, paired with Evergreen’s educational concepts, allow for flexibility. Multi-age classrooms accommodate the developmental continuum of all students—from remedial to advanced. In a multi-age classroom, age distinctions are greatly reduced. At Evergreen, students are grouped into four levels, which generally correspond to developmental stages: Multi-age pre-school consists of 3, 4 and young 5 year olds; Team 1 comprises students traditionally in kindergarten and grade 1; Team 2 includes students in grades 2 and 3; and Team 3 is made up of students in grades 4 and 5. In a multi-age classroom the “older” students model learning, appropriate behavior and can explain how their team works to younger or new classmates. The “olders” are not the only ones leading. Younger students’ learning can be challenged or enhanced by learning with older students. All students are able to learn from each other--building a sense of community and teamwork. The skills children develop when they learn how to work together stay with them for a lifetime. Evergreen extends the multi-age concept throughout the school with Team Time. Students from pre-school through Team 3 are divided into Team Time groups. Each group is paired with a teacher. Team Time groups meet once a week to study our school’s theme. Team Times usually begins with all of the students meeting together and then breaking into their smaller groups. Team Time activities include research, projects, experiments, movies, field trips and much more. It is a wonderful interaction of all ages; it is community. Our weekly worship times are also multi-age. Our students collaborate with teachers to plan and lead our worship. Twice a month we have prayer circles where the children meet with their Team Time groups to sing, pray and study Scripture together. The balanced calendar at Evergreen adds days to the beginning and end of the traditional school year. Those days are then spread throughout the year as “enrichment weeks,” during which families can enroll their children in unique enrichment sessions offered by Evergreen or just take a break with family. 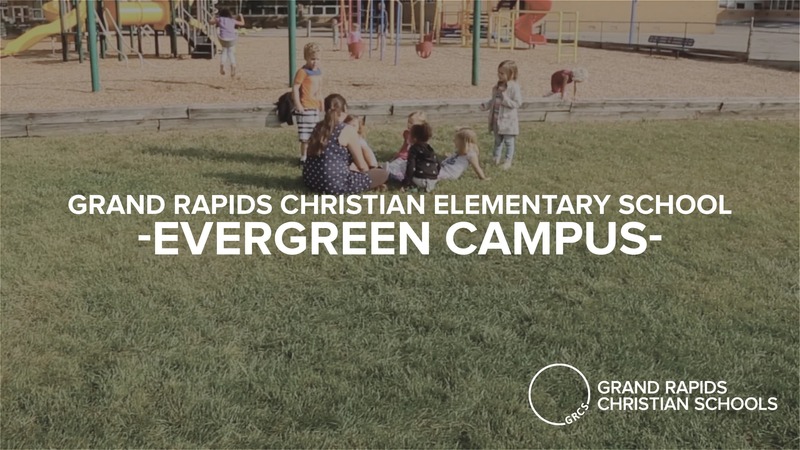 Although students at Evergreen start earlier and end later than students at other schools, they have the same number of school days. They simply have more breaks throughout the year. Education experts believe that a more continuous school schedule fosters learning and keeps students engaged. Shortening the long summer break helps students retain more information, and the added enrichment weeks throughout the school year give students an opportunity to experience and learn for a whole week outside the classroom. The enrichment sessions at Evergreen Christian are a truly unique and exciting aspect of the school. Our goal is to provide students with learning experiences that encourage them to explore what’s beyond the walls of their classroom. Our calendar allows for two enrichment weeks throughout the year. Our fall enrichment session occurs at Camp Roger. Every morning our students eagerly climb aboard the bus for a day full of planned activities at Camp Roger. The staff at Camp Roger works very closely with us to provide five educationally fun filled days of learning activities that coordinate with our program’s yearly theme. Our February enrichment session has involved a range of multi-disciplinary topics. Students have learned and later performed musicals, studied other countries, donned the coats of scientists to study cells growing in their petri dishes, and traveled by snowshoes through the woods, searching for signs of animals. "The balanced calendar attracted us, but this program taught them how to think, rather than memorize and regurgitate." "I feel like our older kids have been taught in such a way that they now enjoy the process of learning." "Inquiry learning drew me in, and then the multi-age classrooms. I value the idea of teaching how to think rather than what to think." "The first thing that comes to mind is the community – a family atmosphere which is partly due to the size of the school." Click here to see all GRCS news and updates. Kids Care Summer Day Camp Registration Now Open!